Correct Wheel Sizes, PCD, Offset, Rims and Tire specs for Pontiac Torrent series. My parents are getting rid of their Santa Fea and they have all season tires 16/22/70R16 to give away. 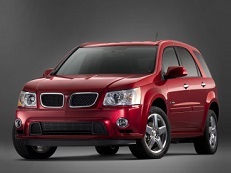 I have a 2006 Pontiac Torrent would the tires possibly fit on my truck? I have a 2008 Pontiac Torrent and wanted to let you know that there was an optional P235/60R17 wheel available. Hi,Deepak Shirke,The facory tyre size is 235/65R16.